It’s been awhile since we’ve announced any of our app’s latest updates. That’s not because there haven’t been any. Now, you can create a real sense of urgency with your Campaigns. Set entry limitations as in, “the first 100 people to enter will receive ______.” Setting entry limitations within your Campaign’s entry form can help you test the waters for a future promotion, create a feeling of exclusivity, or even help you unload some of the extra merchandise your Office Manager ordered for the Company BBQ. Mobile users make up a significant chunk of Campaign participants, so now entry forms come equipped with a field-specific keyboard to make it even simpler to enter from mobile devices. 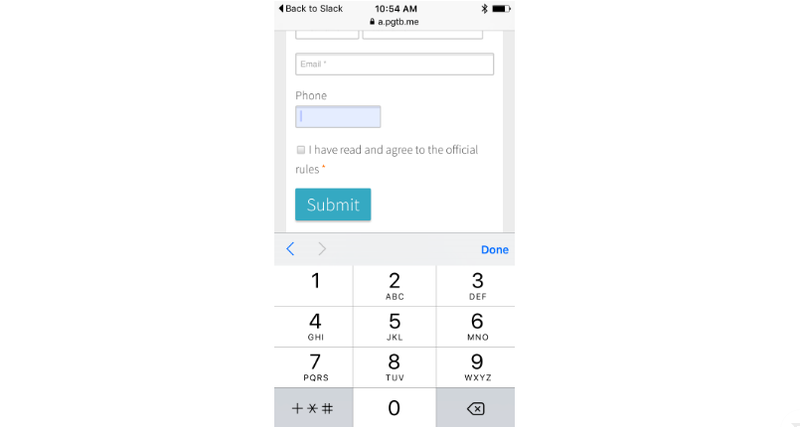 For example, email field keyboards will include an ‘@’ sign, phone number fields will show numbers, etc. If you’re taking advantage of the Tags and Permissions features within ShortStack and ShortStack for Teams, you can save a whole bunch of time when creating new Campaigns from ‘My Templates’ or when creating a template from a Campaign. This recent feature update will ensure all of your tags and permissions will be transferred to your new Campaign or template automatically. Easy peasy! Instagram Campaigns are all the rage these days, so we’ve streamlined the process of setting them up! Now, you’ll no longer need to authorize your Instagram account when adding the Instagram Photo Upload to your Campaign. To make this update even sweeter, the end-user can now submit “private” photos from their Instagram account. Previously, only “public” photos could be submitted. To read about all of ShortStack’s improvements, visit our Changelog.